Legislation that would introduce minimum distances when motorists pass cyclists has been supported by the Economy and Infrastructure Committee. If passed by Parliament, the Overtaking Bicycles Bill would require drivers to maintain a minimum gap of between 1 metre and 1.5 metres when overtaking cyclists. “Overall, the Committee concluded that the rule changes proposed in the Bill are likely to have a positive impact on road safety and should be supported, though with some modifications,” said Committee Chair Joshua Morris, who presented the Committee’s report to the Legislative Council today. The Committee has recommended a number of technical amendments to the Bill and has also made recommendations to improve road safety, even if the legislation is not passed by Parliament. 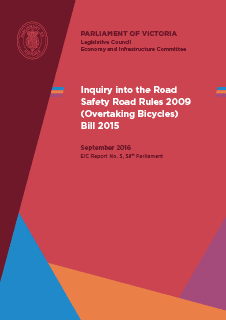 “The provisions in the Bill would be one step towards making the roads safer for cyclists. But they are not all that can or should be done,” Mr Morris said. “Regardless of whether or not the Bill is passed, cyclists’ safety is an issue that needs the attention of governments. The Committee received 172 submissions, with a majority supporting the minimum distance rule. It also considered how similar rules operate in other jurisdictions. “Preliminary data from Queensland and surveys of road users from a number of jurisdictions suggest that the rules have increased cyclist safety,” the Committee said in its report. It will now be up to the Legislative Council to consider whether it supports the Bill and the Committee’s recommendations.